Crown Heights is a neighborhood undergoing rapid change, but the western area south of Eastern Parkway has remained relatively quiet and unaltered by new development. However, it appears that could soon change. 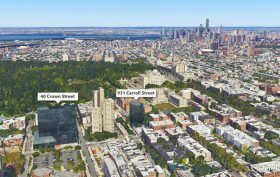 As The Real Deal reports, Cornell Realty Management is hoping to rezone two parcels at 40 Crown Street and 931 Carroll Street, just one block from the Brooklyn Botanic Garden, to make way for a pair of towers that would house more than 500 residential units.